The highlight of the OMD season. It’s Spring time: the sun is shining, the sky is blue and collectors and curators are all over the place, dwelling in museums, auction houses, galleries and, first of all, the Palais Brongniart (Place de la Bourse). For those who have registered in advance there is a special program of visits to museums in and around Paris. The Musée du Louvre printroom has a dry reception for guests on the Monday evening, with drawings on display in the reading room, the curators giving information. The opening of the Salon (champagne!) is on Tuesday at 15:00h., for invited guests only. The main local auction houses Christie’s, Art Curial and Drouot have their OMD sales during this week. 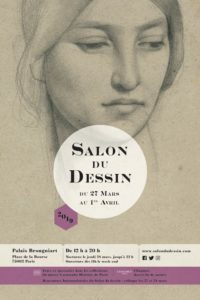 Noteworthy is the sale of around 30 drawings from the Jean Bonna collection at Christie’s on 27 April 2019. More information on the Salon’s website.